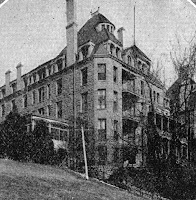 In 1908, the Eureka Springs Crescent Hotel was opened as the Crescent College and Conservatory for Young Women and served as an exclusive academy for wealthy ladies. Unfortunately, the school closed in 1924. The Crescent College and Conservatory for Young Women was originally established in Little Rock, Ark., in 1898. It was non-sectarian and non-denominational, but distinctly Christian, and solicited its patronage from only the best and most refined families solely upon the merits of the institution. The building was erected originally for a high-class hotel, and nothing was spared to make it comfortable, convenient, attractive and safe. It is at once the most complete and substantial building and the most magnificent and expensively constructed property in the United States used as a young women's College. For more details on the school, read the Crescent College historical sketch taken from the 1911-1912 catalog. See also: Crescent College and Conservatory (The Encyclopedia of Arkansas History & Culture Project) and The Crescent Hotel, Eureka Springs (Haunted Arkansas).